Do you need a Toddler Program during non-traditional hours? The Stepping Stones Child Care Elphinstone location in Regina has extended hours! And with over 40 years of child care in the Regina area, we have the experience, dedication, training and nurturing environment you want in a child care! The Toddler Program at Stepping Stones Child Care is for children age 18 months to 30 months and is available at all three of our locations in the Regina area! 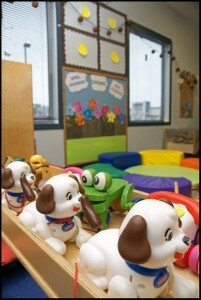 Our child care staff to student ratio is also kept low to enable more personalized attention. A low ratio allows the staff to help toddlers explore the world around them and learn all these amazing new skills! The Stepping Stones Child Care Toddler Program ratio is 1 staff for every 5 children. Children in the Stepping Stones Child Care toddler room are just learning how to socialize and do not quite have the understanding of sharing yet. Parallel play is the first stage that the toddler group engages in. Stepping Stones Child Care Co-operative helps your toddler explore! Parallel play is very beneficial to your youngster, as they sit next to another child their age and note some of the interesting things the other child is engaged in. During companionable side-by-side play, they may mirror the play or activity, but not necessarily engage with the child. That’s OK, and actually a very important phase of their learning. 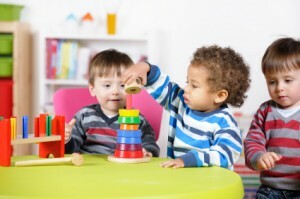 As they grow, toddlers will learn to play cooperatively. Children in the Toddler Program take part in a wide variety of activities including outdoor play, block play, water play, and circle time with songs, stories and finger plays. This is an exciting learning time for them!! The Stepping Stones Child Care Toddler Program is available Monday to Friday 6:30 am to 6:00 pm at our Robinson Street Location, 7:00 am to 6:00 pm at our Broad Street location, and 5:30 am to Midnight Monday to Sunday/ 7 days a week, at our Elphinstone Street location.